You all know about this one of the most popular and trending social media network where billions of profiles are made and millions of them are online every time. Here we are talking about “Facebook”. Without any doubt, I can say that you’re all will be familiar with Facebook and this will be part of the websites you visit most of times. But here what we are talking about? You know there on the Facebook, one feature called “facebook pages” which are created by the brand, organizations, extraordinary persons, actors etc so if you are a fan of them then you will have to like their page to get their latest news and updates on your timeline. There are almost tons of pages created on facebook, but now a days there are a lot of fake pages created on facebook by other users which shows that this is real page of what you are looking for. So keeping that in mind I decided to write a post on this topic that how you can make difference between a real page and a fake facebook page. After facebook noticed that people are creating fake pages with the other’s name/brands so they started a feature through which you will be able to identify a real and fake facebook page. Actually we’re talking about that feature i.e “verified pages” which was started on may 2013 i think. So if the page is created by the real company, brand or personality, then they will have to prove themselves. If they did, there will be a tick mark on their page so people will easily identify the real page of what they’re looking for. Now if you are still unaware of this feature and don’t know how you can check if the page you liked or liking is real or fake then you are in the right place because here in this post we are going to discuss this trick of facebook. 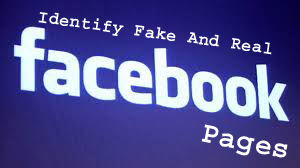 So follow the below few steps for identification of a real facebook page. Step-1: First of all you need to do is as usually, open facebook and search for a name, company or anything else you want to find the page. Here let suppose I want to find the real page of BBC Urdu (British Broadcasting Corporation) so what I will have to search is “BBC Urdu” in facebook Search bar. Step-2: After you make a search, you will get lot of results from which you have to identify the real one, so if you see a tick mark in front of that name. open it and hit like button this is the real page of what you were looking for. 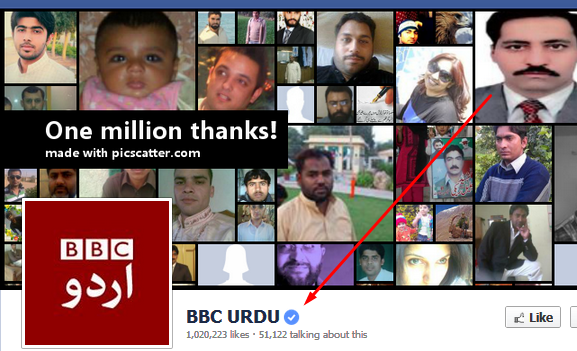 Here what if you searched for BBC Urdu, will be look like just in below screen shot. Same is the case if you are looking for any personality, brand etc. take Shahid kapoor as an example. So friends, above we discussed a little facebook trick, that is how you can identify the real and fake page. I hope you find this tutorial useful. Also share it with your friends and help them prevent from fake facebook pages.